Only lift what you can comfortably handle. Have the senior being assisted do as much as he or she is able during the lift or transfer. If the older adult is unable to assist with the transfer in any way, you may need specialized training and/or adaptive equipment for lifts or transfers. Work at the senior’s level and speed, and check to make sure he or she is not experiencing any pain. Refrain from any sudden jerking movements. Do not ever pull on the senior’s arms or shoulders. Make sure the senior wears shoes with good treads or sturdy slippers. Form a base of support by standing with your feet shoulder width apart with one foot a half-step in front of the other foot. Avoid letting the older adult put her arms around your neck or grab and hold onto you. If the senior is afraid, have her clasp her hands close to her chest during the lift or transfer. Make sure you are breathing deeply, and keep your shoulders relaxed. The best method for preventing back injuries, however, is having another person on hand to help, rather than managing alone. 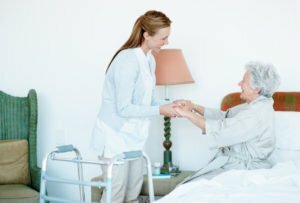 Hired Hands Home Care’s caregivers are fully trained in proper lifting and transferring techniques, and can help make sure that both you and your senior loved one remain safe. Serving Marin, Sonoma, Napa counties and the Tri-Valley since 1994, we’re pleased to offer a free care consultation and home safety evaluation to seniors in need of some extra assistance in the home. To learn more about our top-rated senior care in California, call us at (866) 940-4343.